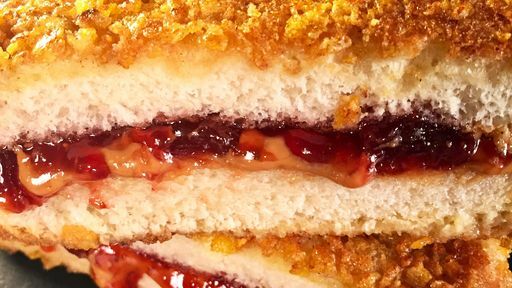 Ayesha Curry for the win with this PB&J Cereal French Toast! Preheat the oven to 175ºF. Put a rimmed baking sheet or platter in the oven to keep the finished French toast warm before serving. Spread the peanut butter and jelly on the bread to make four sandwiches. In a wide, shallow bowl, whisk together the eggs, milk, cinnamon, nutmeg, and a pinch of salt. Spread the cereal on a plate or in another shallow bowl. Dip one sandwich in the egg batter on both sides and shake to drain off the excess. Then coat the battered sandwich thoroughly on both sides with the crushed flakes. Repeat with the remaining three sandwiches. Melt 2 tablespoons of the butter in a large skillet over medium heat. Working in batches, cook each sandwich on both sides until golden brown on the outside and warm on the inside, about 2 minutes per side, adding more butter and wiping out the pan as needed. If the cereal begins to burn, you may need to lower the heat slightly. Transfer each finished sandwich to the baking sheet in the oven to keep warm. Cut each sandwich into halves or quarters and enjoy with a giant glass of ice-cold milk! Tip: Also works great with Almond Butter!